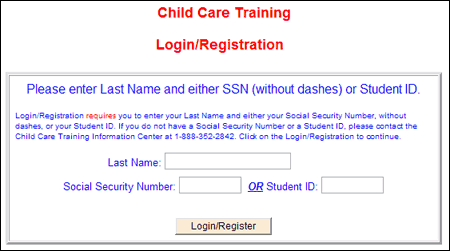 The following screen is the main page of the Department of Children and Families (DCF) Training system. This page provides links to a broad range of information related to DCF training requirements and opportunities. 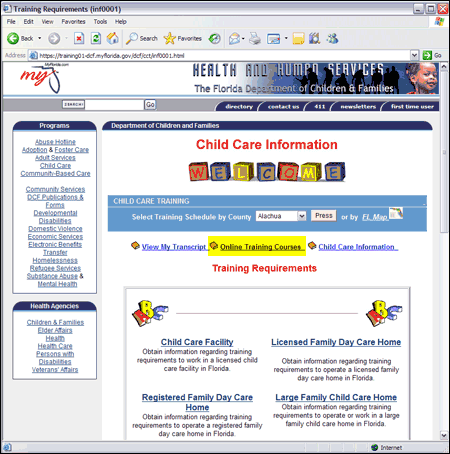 This page also provides access to online training opportunities for child care providers. To access online courses, select the "Online Training Courses" link near the top of the page (highlighted in yellow in the image below). After choosing the "Online Training Courses" link, you will be taken to a page with a list of available courses (see screen below). To register for a course, choose the "Register" link next to the course you wish to register for. 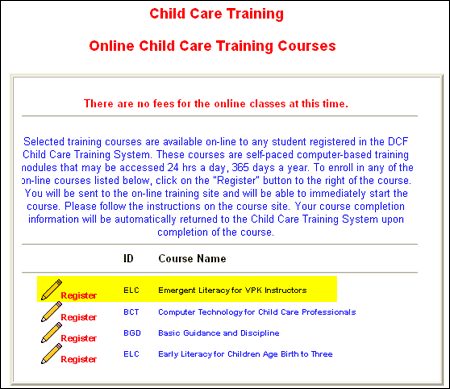 For instance, to register for the Emergent Literacy for VPK Instructors course, select the "Register" link next to it (highlighted in yellow below). After selecting a course from the available courses, you will be taken to a login/registration page (screen below). Provide the required information and choose the "Login/Register" button. 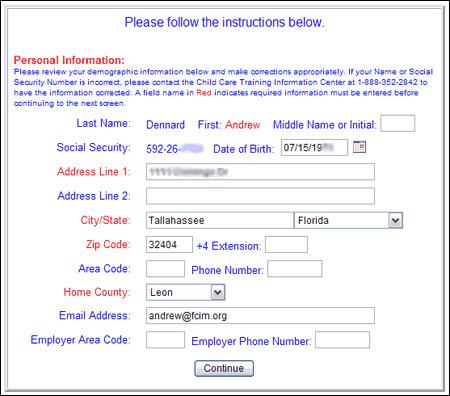 If this is your first time using the DCF system, you will be taken to a screen which asks for additional personal information (see screen below). If you are a returning user, the page will be pre filled with the information you provided the first time you logged into the system. Fill out/verify all of your information (note that field with red labels are required), and select the "Continue" button. You will then be taken to the course you have selected. To access the DCF training system described in this tutorial, click here.